On Thursday, 11/20, we were treated to the edifying spectacle of United States Senators rising to applaud Ted Stevens (R-AK), who is a convicted felon (and was, it should also be noted, a very good friend to gun owners). You’d think that someone in his position would clean out his office at midnight and leave without a word, but this is the Senate, and if you’ve done enough favors for enough of your colleagues, you could be caught molesting domestic livestock in the Capitol Rotunda at high noon and someone would rise to praise your kindness to animals. That is why I’m rooting for Al Franken to beat out Norm Coleman for the Senate seat from Minnesota. Franken has all the charm of Michael Moore and is ideologically leprous, but he was a professional comedian, and reasonably successful, and that is what the Senate needs most right now. They’re all comical, but it’s accidental, and Franken could upgrade things. And then there is Majority Leader Harry Reid. In every class in an NCO academy or at OCS, there are always a couple of poor dorks who are washed out for “lack of command presence.” That is Harry Reid. And so, as we bow our heads over our Thanksgiving gruel, let us give thanks that our destinies are in the hands of these dedicated public servants. About the targets: I checked all the websites you recommended, but the one that paid off was the source suggested by Jerry G. The National Target Company of Frederick, MD, picked up the license to make and sell NRA life-sized targets after the NRA dropped them. The life-sized targets are not offered online, but National has ‘em nonetheless; all you have to do is ask. They are invaluable for teaching, and for shooting at long distance, and for checking bullet drop. Prices are reasonable, and National Target is a pleasure to deal with. The phone number is 301-874-4767. A thousand thanks to Jerry G. May all your bullets go where you want them to. And to all of you, a Happy Thanksgiving. Then, because it was the 60s and air travel was way better then, she probably brought him a martini. I can promise Dad was wearing a tie, too, because flying was a big deal and people dressed for the occasion. Today, flying is as glamorous as riding the bus and you can’t even talk about carrying a gun onto a plane. Surprisingly, I have no personal airline horror stories about checked guns. In part, that’s because I fly out of Cedar Rapids, a small airport where people are used to seeing guns among the checked baggage. One day last year I came home late from somewhere in a downpour. At the carousel, all the bags, including my duffel, came off the plane dripping wet. Everything arrived except my gun case. I waited. The other passengers took their bags and left until it was just me standing there. The carousel stopped. I was looking around for the lost luggage agent when a very wet baggage handler walked in with my gun case tucked under the skirt of his plastic poncho. “I figured there was a gun or camera in there so I wanted to bring it in to you instead of throwing it on the carousel where it might get wet,” he said. I love the Cedar Rapids airport. I will have to rely on all of you for airline horror stories. I don’t have any . . .yet. 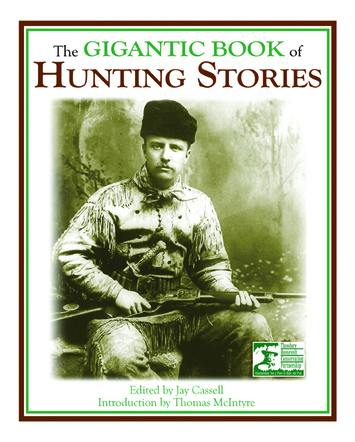 My colleague at Field & Stream, Deputy Editor Jay Cassell, has assembled The Gigantic Book of Hunting Stories a collection that is astonishing in number (119; 782 pages) and outstanding in quality. In most collections there are a few gems, some good stuff, and a fair number of pieces that were obviously included to pad out the page count. But TGBOHS is the best work of the best writers, all the way through. All the heavyweights are represented here. It starts with Teddy Roosevelt and progresses through nine more chapters: waterfowl, small game, big game, deer, Africa and Asia, and so on. Nothing is neglected. A small example of how good TGBOHS is: Corey Ford was for years a mainstay of Field & Stream, and is remembered for his series, The Lower Forty, and for his story, The Road to Tinkhamtown, which is on the short list of the greatest pieces the magazine has ever run. Tinkhamtown is in here, but Ford also wrote a very short piece that may be its equal, or better, and very few people have ever heard of it, much less read it. It’s written in the form of a letter and is titled “Just a Dog.” It ran only once, in 1940, and created such a furor that it has never run again. Reading the piece is like getting punched in the chest. Jay Cassell has rescued Only a Dog from oblivion, and it alone is worth the price of the book, which is $25 from skyhorsepublishing.com. Christmas is coming. Need I say more? Two weeks ago, I showed up at a South Carolina plantation to hunt whitetails. The owner, a hunter of vast experience as well as a person of the highest literary and moral worth, asked me what rifle I had brought. I said a plain-vanilla .270, and his reaction was as though I had announced I was a descendant of William Tecumseh Sherman, or that I carried a turd in my pocket for company. The .270, he said, was notorious for letting deer escape, even fatally shot ones, and this was not only his experience but that of the owner of a nearby plantation who had kept careful records over many years. As it was, I killed four deer, all lung shots, one shot each. One dropped in her tracks; the other three ran 50, 75, and 30 yards, which is about average. I've been hunting whitetails in South Carolina since 1983. In that time I've used everything from a .257 Roberts to a 7mm Weatherby magnum and a great deal in between. I have not seen any evidence that one cartridge killed any quicker than another. My experience is that most deer (probably 70 percent) go on a last mad dash before piling up. I've never seen one go more than 100 yards, and very few have gone that far. I don't believe they run with any destination in mind; they only run. As the late Finn Aagaard pointed out, deer will go as long as there is any oxygen in their brain; when that runs out it's all over, and they can absorb the most horrendous damage and still cover ground. The moral is, shoot good and keep looking. None of my four deer left a blood trail, but they were found almost immediately. One time, I was around when a very good hunter shot a very good Alabama buck and it took a day and a half to find the animal. It would have been easy to quit, but the hunter didn't. Neither should you. Because my wife compulsively spends all our money on heat, electricity and similar luxuries (Do my kids really need new shoes? Couldn’t they just wear my old ones? ), my gun fund is perennially tapped out. As a result, cool guns at great prices get away from me all the time. The latest was just last week. My local store took in a nice older 870 trap gun in excellent condition with well-figured wood and cut checkering. They priced it at $350. By the time I got home, figured out what gun I would trade for it and went back, it was gone. Occasionally I get lucky. For years I was fascinated by the idea of the Browning Double Automatic. I wanted one desperately even though I had never actually seen one. In a stroke of serendipity, the same day I received a modest inheritance check, not one but two Double Autos magically appeared at my local store. I bought one of them, a Twelvette, loved it, shot a bunch of roosters with it, then foolishly sold it. Last year, I turned a windfall into an SKB 100 that I was able to grab before anyone else saw it. At $500, it wouldn’t have sat unsold for more than a day or two. All gun lovers have sob stories about the ones that got away. Share yours. It’s good therapy. On the other hand, if you’ve lucked into bargains on guns you always wanted and would like to tell us about it here, you can do that, too. First, to all of you who suggested sources for deer targets, thanks and God bless. I shall pursue them. For everyone who pulls a trigger there are probably 100 servicemen and women who repair gear, or man radar equipment, or work in hospitals, or process payrolls. They get no medals; they work long, hard hours; they sometimes do not have enough to work with; they are usually highly skilled and could make a lot more money as civilians but they stay in anyway. They are heroes. About John Barsness: Don Polacek, who is president of Wolfe Publishing, says that John and the company had a disagreement about business and that their parting was non-hostile. Polacek says that he still considers John a friend. I asked Polacek why there was no mentiion of John's departure in the first issue of Rifle without his byline, and Polacek pointed out that this is a tradition with the magazine. In the past, when other greats such as John Wootters, Ken Waters, and Bob Hagel have left, there was no mention of their going, either. I think they're going to miss John a lot, but they have other talented people. I've been a subscriber since the 1970s, and will be keeping my subscription. A blogger named Joe C. objected to my making light of scope cuts, and felt that they are a result of poor training and poor scope mounting. I beg to differ. If you work with horses for any amount of time you are going to get kicked or bitten or thrown no matter how careful you are. If you fish you are going to get hooked, no matter how careful you are. If you shoot enough you are going to get scope cuts, no matter how careful you are. I would be lying if I said otherwise. True sportsmen are able to laugh at minor misfortunes, and every scope cut I’ve seen qualifies as a minor misfortune. Getting your teeth kicked out or getting a tarpon hook in the eye is not funny, but if you can’t smile at the lesser stuff, stay away from me. I don’t want to hunt with you. To RJ, who has to learn to shoot right-handed. First, don’t give up on the idea of using a scope. It may be that if you give your right eye some help it can do the job. Get in touch with Decot Sport Glasses (sportglasses.com) and explain your problem. They’ve been around forever, and have seen every eye-related shooting problem there is to see. Try that first. If glasses don’t work out, I would consider a ghost ring rear sight with a big bead up front. It’s the easiest type of iron sight to use, and you can do some very respectable shooting with it. To Carney, who asked about Susan Casey. As far as I know, Susan has put down her rifle forever. She is simply unwilling to kill. The last I heard she is doing a book on a small group of surfers who are looking to ride rogue waves in mid-ocean—the 70- to 100-footers that sink ships. I wish her all the best. It was a hell of a story, wasn’t it? This past Sunday, I watched the Jets’ 47-3 disembowelment of the Rams, and one play stuck in my mind. Bret Favre (who is a hunter, by the way) rolled out to the right and, ignoring the four 315-pound life forms who wanted his blood, waited for what seemed an incredible length of time before he zinged the ball right between a St. Louis defensive back’s hands and into the hands of his own receiver. A less experienced quarterback would have panicked and thrown an interception, or eaten the ball, or tried to run and got nailed, but Favre, who has done this a lot, knew how much time he had down to the hundredth of a second. So it is with big game hunting. There are situations when you have to shoot right now and situations when you can take can take your sweet time. Beginners never seem to get it right. They will panic, throw the rifle to their shoulder, and fill the air with lead. Or they will fuss and fidget and aim, and aim, and aim, and in the meanwhile, the critter will get bored and leave. 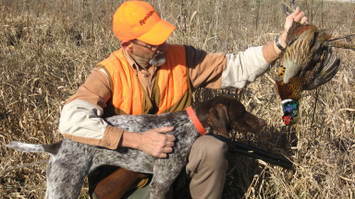 A veteran hunter will know from years of watching animals and studying their body language, just how much time he has. Usually it’s more than you would think, and it increases with the distance between you and the victim-to-be. Whitetails, for example, have a distinct facial expression when things are not to their liking. It looks like a frown. Years ago, sitting in a rhododendron patch on a West Virginia hillside, I was approached by a doe and a fawn. The doe was perhaps 10 feet away, and there were enough of my scent molecules in the air to cause her concern. The expression on her face was that of a Detroit automobile industry executive pondering his/her future. Then she got the full load of essence de Petzal and ran like hell. They study us, too. In 1981, I was hunting sable in Zambia, and the instant the big antelope saw me and the PH they would go thundering off in a cloud of dust and sable s**t. After I killed one, we practically had to kick them out of the way to get to other animals. Most herbivores can tell what our intentions are, so try to adopt a non-threatening demeanor when in the woods, and take your time aiming. But not too much time. Bear with me. This really is a post about hunting gear. When my younger son John was still a baby, we took a family car trip east. Right after we drove across the New Jersey line, it became pungently apparent that John needed a fresh diaper. We pulled into a crowded service plaza to use a restroom, only to find the power out in half the building. When I walked into the men’s room, it was pitch black except for a circle of light bobbing over the changing table. There was a dad at the table, holding a mini-Mag Lite in his teeth to keep both hands free as he put a clean diaper on his child. He finished, saw me and John waiting our turn and handed me the flashlight. “Take this. A guy in here changing his kid gave it to me. Give it to the next guy who needs it.” With that, he disappeared into the gloom. I was halfway through changing John when the lights came back on. My benefactor was gone. No one else would need the light, so there was nothing to do but keep it. Now, although I own eight or ten better, brighter, higher-tech lights, that blue Mini Mag remains my favorite. It’s the light I wear on my belt for early morning and evening hunts. John is 14 now, and I brought the light with me on our recent Youth Duck hunt together. It reminds me of how much he has grown, and of the kindness of a total stranger in the dark. We tend to think of guns when it comes to hunting gear with sentimental value, but little things -- lights, knives, calls -- can have special meaning, too. Anybody else own some little item that means a lot? This past Friday I was coaching a young hunter in the finer points of riflery when he got careless with the .30/06 he was shooting and received a medium-good scope cut in his forehead. He asked me not to mention it to anyone and I said, Pish tush, you should be proud of it; it’s the mark of the rifleman. I then pointed out three or four of my choicer scars. The two best I’ve ever seen came from a .30/06 with a cheap scope that had no eye relief to speak of, and a .300 Weatherby, whose owner contorted himself into a weird prone position, shooting downhill at a caribou. The ocular lens bell caught him on the bridge of the nose and opened it up like an ax. My own best scope cut came from a .30/378 with a muzzle brake. I was curious how hard it kicked without the brake and fired it prone. I found out. Some people, upon getting a scope cut, are like to swoon, and develop PTSD. Others brush it off. Susan Casey, who wrote a wonderful story for Field & Stream about an elk hunt on which she could not bring herself to pull the trigger, got a medium one, and decided she liked it. “It makes me look like a badass,” said Susan. In 2003, I bought a bunch of life-sized whitetail deer targets from the NRA that have been by far the best teaching tool I’ve ever seen if you want to teach someone how to shoot whitetail deer. The vital zones are marked so you can’t see them at a distance, just like real deer. Last week I tried to reorder, but no one at the NRA seemed to know what I was talking about, and I’m afraid they’ve been discontinued. Does anyone know anything definitive or, failing that, does anyone know of anything similar? My gratitude will be nearly boundless.